The Internet Marketing Driver: Performing Keyword Research and SEO, Don’t Assume You Know the Right Words to Target! Performing Keyword Research and SEO, Don’t Assume You Know the Right Words to Target! Right now, some of you are probably skeptical. That’s good, and I’ll give you some examples to curb your skepticism. Let’s say you are in the summer rental business at the Jersey shore. If you performed keyword research for your business, you would find that beach rentals is searched 4X more than summer rentals, which in turn is searched for 10X more than nj shore rental and beach house for rent. Without keyword research, it’s all based on opinion… I’ll take real data over opinion 99% of the time. That’s one thing about keyword research that I love… it takes guesswork out of the equation. Armed with data, you can make the right decisions from the beginning of your seo project before wasting time, money, and effort. Do you sell jewelry? 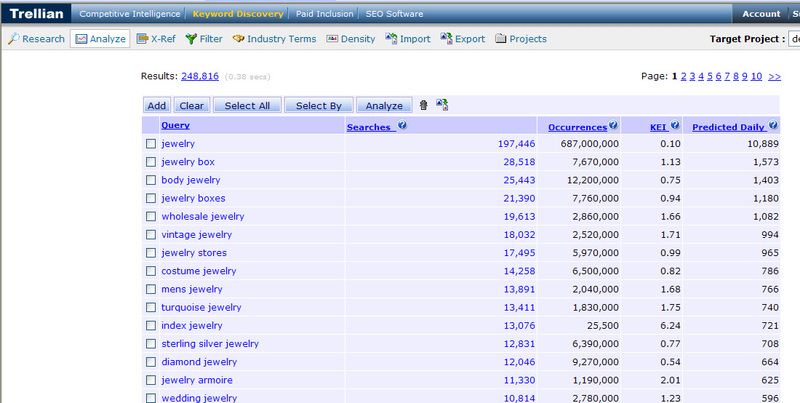 Did you know that the keyword jewelry showed up 12X more than the keyword jeweler in Keyword Discovery? Let’s shift our focus to a buggy business? Pest control is searched 10X more than exterminator. Sell infant bedding? Did you know that the keyword baby bedding showed up 16X more than the keyword infant bedding? That's 16X more! I think you get my point… Do your keyword research and move opinions to the side…focus on real data, real searches, and don’t waste your time and effort trying to rank for keywords that won’t pay off. The two most popular options for keyword research are WordTracker (WT) and Keyword Discovery (KD). I have used WordTracker much longer than Keyword Discovery, but I can tell you that I’m really digging KD. Both are great tools and will give you excellent data. WordTracker’s database holds approximately 330 million metacrawler searches where Keyword Discovery holds over 36 Billion from over 200 search engines. I often find myself using both tools to find the right keywords, and if you focus on SEO, I would probably keep accounts with both services. Their prices won’t break the bank… WordTracker is $59/month and you can get a fairly large discount for an annual purchase ($329 for the year). Keyword Discovery is $70/month and I believe both are a small price to pay for finding the right keywords via the multitude of tools they provide. Your return on investment should be huge, to say the least. Let’s say you sell women’s jewelry and wanted to do some keyword research. You would log into KD and enter jewelry in research mode (see screenshot below). 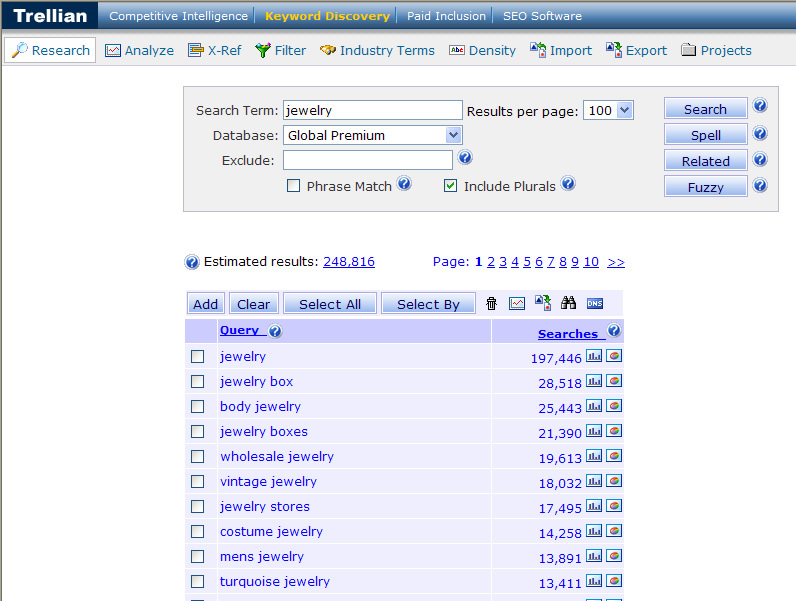 You will see the top searched terms with the keyword jewelry in them. The one column provided at this stage is “Searches”, or the number of times that the keyword was searched for over the past 12 months. Now, if you click the icon for “Analyze”, then you will see those keywords with some additional columns like “Occurrences”, “KEI”, and “Predicted Daily”. Occurrences shows the estimated number of webpages the keyword shows up on. KEI is a formula for showing you how competitive the keyword is. I can dedicate an entire post to KEI and you can read more about it on the web, but not all keywords are equal from a competitive standpoint. KEI helps you determine which keywords are worth going after and which ones might be too tough to rank for. Predicted Daily is just that, the predicted amount of times that the keyword is searched for each day. At this point, you can click on any keyword to see a list of longer tail keywords containing the original word you clicked on. For example, click diamond jewelry to see all the keywords in the database that have the words diamond and jewelry as part of the keyword. This will include diamond jewelry watches, black diamond jewelry, diamond jewelry stores, etc. Then click “Analyze” again to view the additional columns I mentioned above. I have my keywords, now what? In SEO, your work is never done. Once you optimize your website, you can’t just sit back. Like everything in web marketing, you need to track your results and refine your strategy as needed. Maybe some of your optimization isn’t paying off like you want it to, so you may need to go back and research more terms and optimize more pages. Or, you might want to tweak some of your pages, based on changes in your industry, your products, or seasonality. If you are using a robust web analytics package (Omniture, Coremetrics, Google Analytics, etc. ), then you should have some great data to analyze. Then learn from the data and make changes to improve your rankings. I have written several posts about web analytics and you should definitely check them out. OK, I’m sure you are chomping at the bit to get started (at least I hope you are!) Definitely stop back and let me know how keyword research works for you and your business. Go ahead, real data awaits! G-Squared Interactive (GSQi) focuses heavily on SEO, SEM (PPC), Social Media Marketing, and Web Analytics.